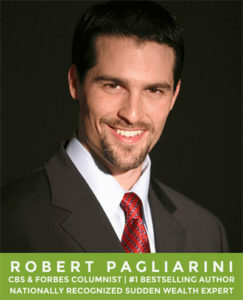 For over two decades, Robert Pagliarini has helped clients manage, grow, and preserve sudden wealth. Robert Pagliarini—a Certified Financial Planner who also has a master’s degree in financial services and another in clinical psychology. Robert has spent nearly two decades demystifying saving, investing, and insurance, as well as retirement, estate and tax planning to protect his clients and help them achieve their most important goals. Robert is an avid reader and writer. In addition to authoring four bestselling books, he also writes a weekly column for CBS News, which is syndicated to newspapers across the country. Robert is frequently called upon by the media for his financial expertise. He has been featured as a financial expert on Dr. Phil, 20/20, Good Morning America, Fox Business, Katie with Katie Couric, ABC News, Dr. Drew’s Lifechangers, and in the Wall Street Journal, Chicago Tribune, Money Magazine, Newsweek, Los Angeles Times, CNN, and has appeared on hundreds of radio programs. Do you want to turn your sudden wealth into lasting wealth? Purchase The Sudden Wealth Solution and learn the 12 principles to secure your wealth.